One of the most interesting findings for me is that smartphones and tablets are actually driving households together again in the main living room. When internet enabled desktops were the only way to watch on-line material, family members were driven to the solitude of their bedrooms to watch on-line alternatives to the live TV offerings. 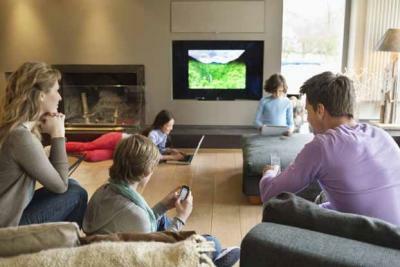 The Report’s researchers found that over half (53%) of UK adults are now media multi-tasking while watching TV. And 25% of these are doing something called “media meshing”, which is doing something else on a device but which is nevertheless related to what’s on the TV. This means that the number of second sets in homes has gone down. 41% of homes now just have one set in their household compared to 35% in 2002. Often one very big set. So advances in technology are actually bringing us closer together , rather than driving us apart. We might just be grunting rather than talking as we manipulate the smartphone while watching Game of Thrones. But at least we’re grunting together rather than in solitude! The trend towards bigger and bigger sets has set me thinking about that other growing communal viewing experience….giant screens in public spaces. These can show anything from Andy Murray’s triumph to a feed of the graduation ceremonies from the local university. These are getting more and more popular, as people don’t just watch them but tweet while watching; relay live feeds through their phone cameras, or self-shoot themselves and their mates in front of some triumphant action on the screen. It seems that smartphones and tablets may not just claim back our living rooms for communal activities but help bring us back together again in our public spaces.